Adam Price and others from the production team for ‘Streic y Glowyr’ accepting the Gwyn Alf Award. Cardiff, 27 September 2015: The British Academy of Film and Television Arts (BAFTA) in Wales, BAFTA Cymru, has announced the winners of this evening’s 24th annual British Academy Cymru Awards, honouring excellence in broadcasting and production within film and television in Wales. The ceremony was hosted by Huw Stephens at St David’s Hall, Cardiff, where presenters included James Dean Bradfield (Manic Street Preachers), Lee Mead (Casualty), Craig Roberts (Just Jim, Submarine), Kimberley Nixon (Fresh Meat) and Alexander Vlahos (Merlin, The Indian Doctor), and featured performances from Amy Wadge and Only Men Aloud. Set Fire to the Stars won three British Academy Cymru Awards, for Make Up and Hair (Andrea Dowdall-Goddard), Production Design (Edward Thomas) and Original Music (Gruff Rhys). Jack to a King also won three, for Director Factual (Marc Evans), Sound (Bang Post Production) and Editing (John Richards). A Poet in New York won two awards on the night, for Feature/Television Film (Griff Rhys Jones) and Special and Visual Effects (Bait Studios). Da Vinci’s Demons also won two, for Costume Design (Trisha Biggar) and Photography and Lighting (Owen McPolin). 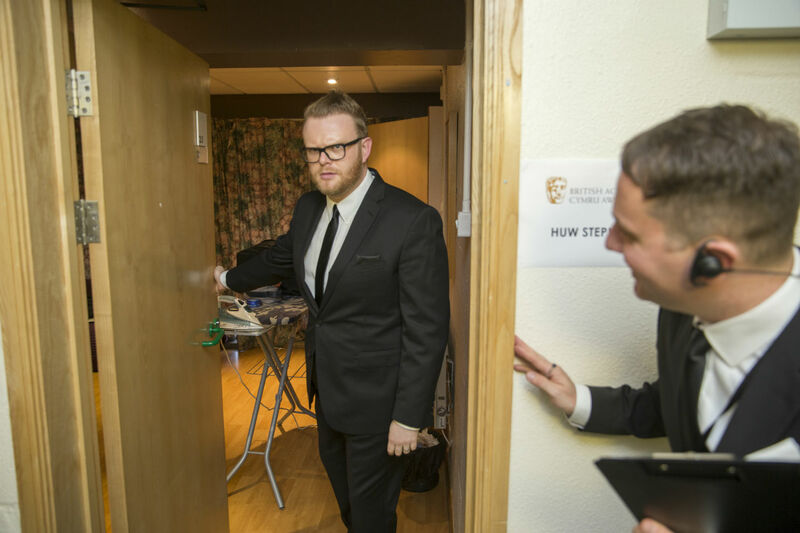 Host Huw Stephens emerges from his dressing room. The award for Actor was presented to Richard Harrington for his portrayal of DCI Tom Matthias in internationally-acclaimed Y Gwyll/Hinterland, the Welsh language drama which also triumphed in the Titles and Graphic Identity category (Sarah Breese). The award for Actress was presented to Rhian Morgan for her role as Gwen Lloyd in Gwaith/Cartref. Y Streic a Fi won the Director Fiction (Ashley Way) and Television Drama categories and Tir won for Writer (Roger Williams). Some of the cast of Casualty, including Amanda Henderson (second from the left) and Lee Mead (far right) who were citation readers on the night. 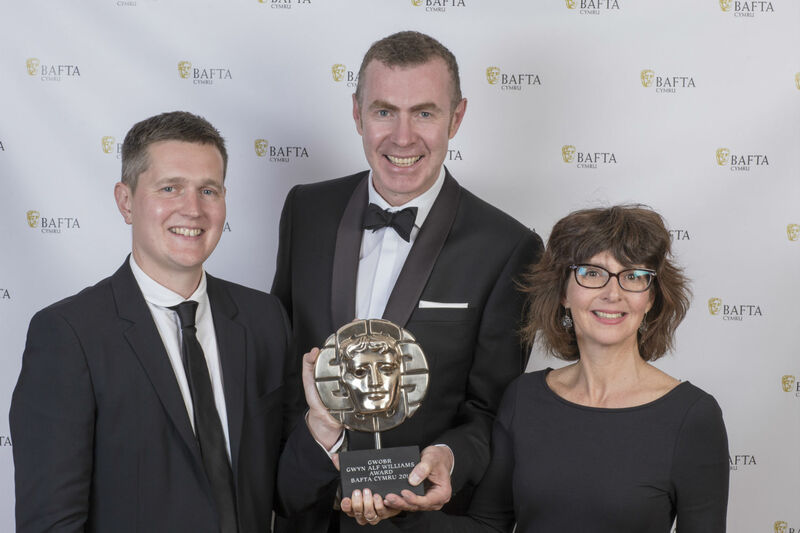 In the factual programming categories, Single Documentary was won by Jamie Baulch: Looking for my Birth Mum and Factual Series was won by Adam Price a Streic y Glowyr, which also took home the Gwyn Alf Williams Award. Y Byd ar Bedwar won the Current Affairs award for the third year running and Rhod Gilbert won the Presenter award for RAF Fighter Pilot: Rhod Gilbert’s Work Experience. This year’s Breakthrough award was presented to producer/director Clare Sturges for her documentary Sexwork, Love and Mr Right. The Siân Phillips Award was presented to director Euros Lyn by his close friend and colleague, Russell T Davies. The ceremony closed with the BAFTA for Outstanding Contribution to Television being presented to Menna Richards OBE, the Controller for BBC Cymru Wales from 2000 to 2011. The award was presented by the former BBC Head of Nations and Regions, Pat Loughrey.